Delicate, easy to wear and utterly irresistible, a bar necklace can make a big impact, or effortlessly supplement your overall look. It will always be adaptable to your wardrobe choices, whether you prefer very feminine pieces or punk rock statements. Minimalist bar necklaces suggest precious Bullion ingots - your own, very personal, store of value - and boasts of elegance and sophistication. A chic bar necklace is ideal for those who prefer versatile pieces as you can adapt this jewellery to either casual looks or high fashion choices. Allobar drop flat ingot necklace. Modern, contemporary design, in sterling silver, that works well as everyday wear. Also available in 14ct yellow gold vermeil. Matches the plain atomic Allobar ring. Allobar 2mm ingot necklace. Silver ingot, incorporated into a beautiful adjustable chain. Matching silver ingot earrings available. Curved bar necklace in 14ct rose gold vermeil. Fluid chain with an incorporated round bar that sits gracefully around the neck as an everyday piece of jewellery. Also availabe in sterling silver and 14ct yellow gold vermeil. Curved bar necklace in sterling silver. Fluid chain with an incorporated round bar that sits gracefully around the neck as an everyday piece of jewellery. Also availabe in 14ct yellow and rose gold vermeil. Allobar curved bar necklace in 14ct yellow gold vermeil. Fluid chain with an incorporated round bar that sits gracefully around the neck as an everyday piece of jewellery. Also availabe in sterling silver and 14ct rose gold vermeil. Gold Bar Necklace 2mm wide. 14kt Gold vermeil over sterling silver bar incorporated into a beautiful gold vermeil adjustable chain. Matching gold vermeil bar earrings available. ...it’s also a show stopping piece that’s perfect for a special occasion. Alternatively, for even extra sophistication and elegance, why not opt for a double bar necklace with cubic zirconia stones. This style of necklace can boost the most simple of outfits and really make a statement. For everyday wear, to the office or on a coffee break, a simple bar necklace is perfect. 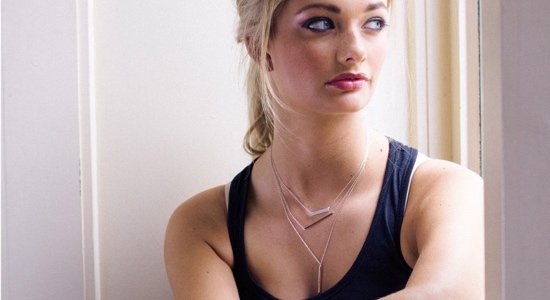 A flat bar necklace is uber minimalistic, however, it’s far from boring. This refined piece is understated, yet charming, added pure femininity to your personal style. You could wear it on its own or layer with other necklaces to make the transition from daytime to evening. Why not wear a traditional bar necklace with a lariat necklace for a modern take on accessory styling. This will add movement to your outfit, and pairing with bangles, rings and earrings can create a striking boho look, which is ideal for the summer festival season. If only wearing one necklace is more your preference, then a drop bar necklace will provide a wonderful addition. You could wear this either with a low V-neck tee and jeans or with a pretty dress for a formal occasion.